e-pill MedSmart PLUS Monitored Automatic Pill Dispenser will notify a remote caregiver if medications have been missed. This e-pill Organizes, Reminds, Dispenses and Notifies. Phone, e-mail or Text Message. It will send out the alerts if the alarm has been going off for 60 minutes. Note: this e-pill monitored automatic pill dispenser device works only in USA and Canada. This Robust Medication Management Solution, the e-pill MedSmart Monitored Locked Automatic Pill Dispenser helps ensure that medications and vitamins are taken properly and on time. All the patient has to do is to wait for the alarm, turn the dispenser over, and dispense the medications. Right Meds, Right Dose, Right Time - Every Time with your e-pill MedSmart MONITORED Dispenser. Calls your cell phone (or regular phone), sends a text message, or sends an e-mail notification if medications have not been taken within 60 minutes of the scheduled alarm time. Dispenses up to 6 Times per Day. Loud Alarm and Flashing Light. Lockable with KEY (2 keys included). Patient Compliance Dashboard� allows patients to see how many doses are left. FREE Lifetime Monitoring (included in the price). Refill Notification is sent out when it is time to fill the Dispenser. How-It-Works: The alarm will sound & pills rotate into position. The patient will lift device with one hand and turn the dispenser upside down to allow the pills to fall into their other hand. All other medicine is inaccessible. The alarm stops by turning device upside down. Dispense in a medicine cup or in your other open hand. It will sound indefinitely (or a maximum 90 minutes if on battery power). If medications have not been taken within 60 minutes your e-pill automatic pill dispenser will notify the caregiver. Easy Set-up & Tray Loading: Load the pills in the medication 29 compartment tray (two medication trays are included with your MedSmart system). Each compartment has a capacity equal to 20 Aspirin sized tablets. For added capacity you may set two alarms for the same time and double the capacity. Set the alarm clock. You can program up to 6 alarms per day. the unique Early Dose Feature allows patient to access medications before the scheduled medication time. Great for all pills, tablets, vitamins and capsules. With the e-pill MedSmart PLUS's FREE event reporting and notification option, family caregivers and healthcare professionals can monitor a client's (patients's) adherence to their medication regimen. When connected to a household phone (existing phone line, no extra line required), MedSmart transmits device and dispensing history to a secure server supported with a web application for review by authorized individuals via a toll-free number. Through the personalized notification system, alerts can be sent to track adherence, address dosing errors and predict refill requirements. | Log-In e-pill MedSmart PLUS users. Your e-pill MedSmart PLUS includes free event reporting and notification for life for one patient. MedSmart's included docking station with modem serves as the gateway for remote programming and event reporting. 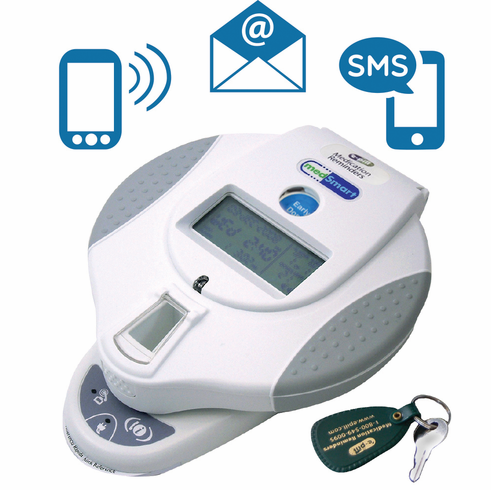 When connected to an active phone line, the MedSmart PLUS transmits device and dispensing history to a secure website, using a toll-free number, for review by authorized individuals. MedSmart can be remotely programmed by the Activation Center to automate set-up and accommodate programming changes. Through a personalized notification system, alerts can be sent to track adherence, address dosing errors and predict refill requirements. You may Log-in to AMAC / Tunstall secure Web site using a password and gain access to reports and on-line inquiries to see the patient's history. Battery life: 6 Months (4 x AA are included). Manufacturer: e-pill, LLC | One (1) Year Warranty by Manufacturer. | 30-Day Money Back Guarantee. Monitoring by Tunstall.